From 34 degrees above Saturn's equatorial plane, Cassini gazed down at Saturn's moon Epimetheus. The region seen here includes territory farther north and east than that imaged in March 2005 (see PIA06226 ). The two largest craters visible here are the only officially named features on Epimetheus. The crater at the left (at about the 9 o'clock position) is named Pollux; the crater at lower left (containing a string of several smaller craters) is called Hilairea. 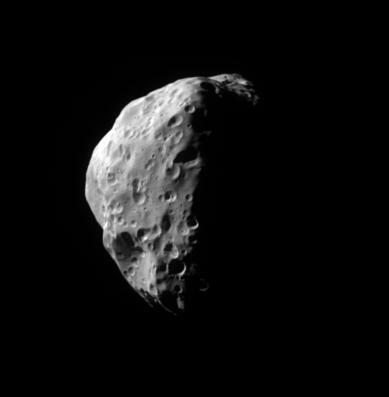 Epimetheus is 116 kilometers (72 miles) across. The image was taken in visible light with the Cassini spacecraft narrow-angle camera on July 14, 2005, at a distance of approximately 87,000 kilometers (54,000 miles) from Epimetheus and at a Sun-Epimetheus-spacecraft, or phase, angle of 95 degrees. The image scale is 520 meters (1,710 feet) per pixel.